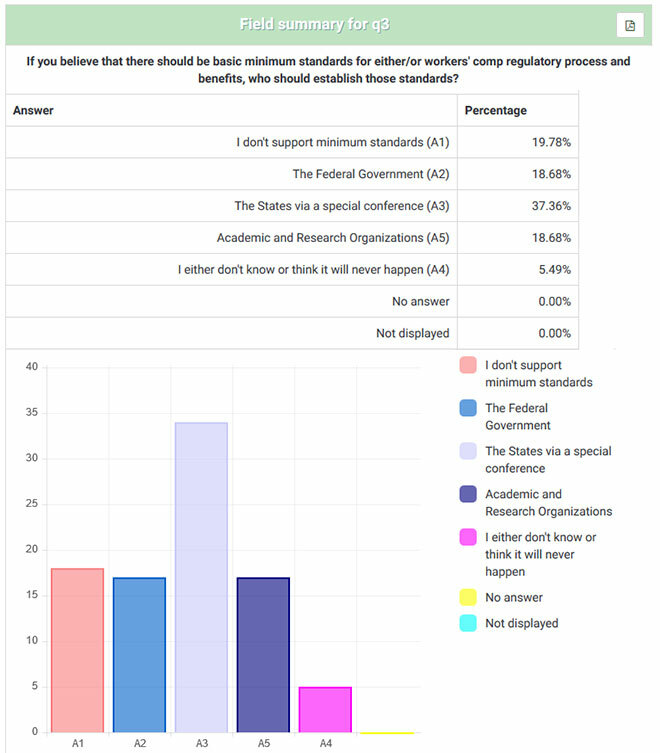 Our most recent CompNewsNetwork Pulse Poll Survey, taking the pulse of the industry on the topic of "Minimum State Standards," is now complete. Below are the raw results from this non-scientific poll. 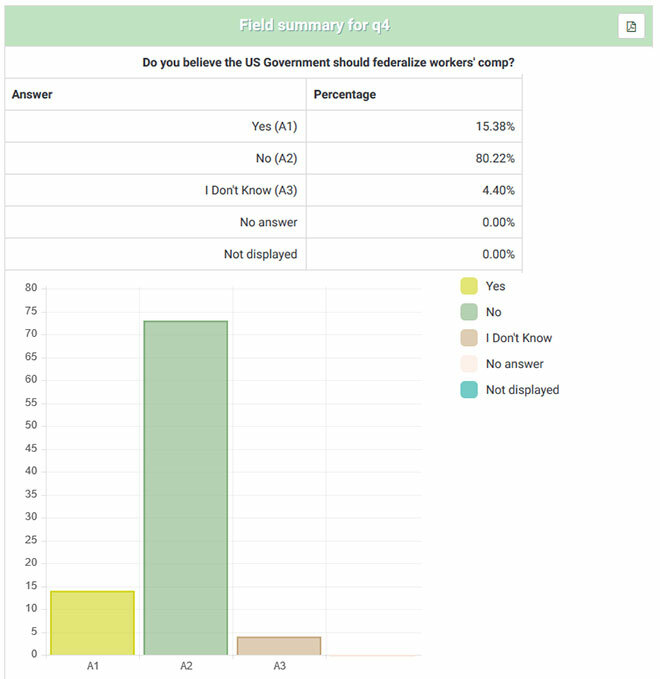 There were 196 respondents who completed this survey. Further analysis will be available shortly in "From Bob's Cluttered Desk." States with monopolistic workers comp systems, specifically Washington state, need to be reviewed and commercial carriers should be allowed in as an option for employers. Please!!! This could help prevent the Race to the Bottom that we are currently seeing. The maximum comp rates in some states are ridiculously low. And the cost shifting by some states on the SSDI program is disgusting. There needs to be insight from injured workers. But if the cost is too hard for the state to become compliant it will be passed on to the employer/insurers and that is not fair since they are baring costs for the program and admin already. Like most things Federal, a federal WC act, administered by federal employees would be a colossal and inefficient bureaucracy completely void of accountability to the needs of the states, it's workers or it's industries. Statutes enacted at the state level are much more accountable to that state's citizens. This is true regardless of whether you feel current statutes are too liberal or too conservative. 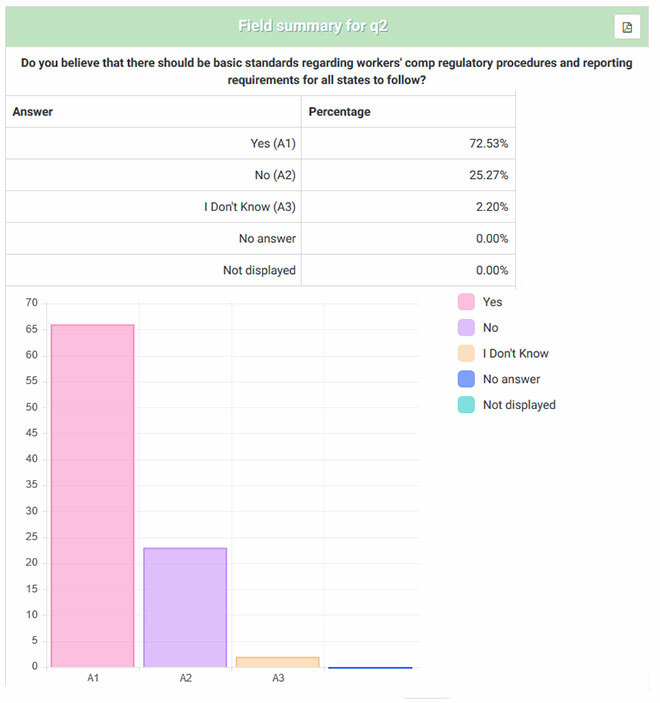 Statutes enacted at a state level reflect the values of that states voters, and can be changed (either way) much more quickly and efficiently than changing a federal bureaucracy. I suspect also that the cost of that bureaucracy would fall to the taxpayers more so than on businesses. I think that standardizing workers comp policies and procedures across all 50 states would definitely simplify the process for nationwide companies, as well as making it easier to ensure compliance with all regulations. The Federal Government is a poor example of a quick and efficient process-- please don't get them involved in actual claims handling. Perhaps an independent committee of workers' comp experts , actually from the field of wc should discuss and make decisions on basic minimums and standards. IF the states' are allowed to discuss, we'll have another Civil War on our hands. Look to the committee already formed and who have met 3 or 4 times already --- Bob Wilson is a member of that committee, along with Cisneros; both VERY respected individuals who could make reasonable decisions about benefits, waiting periods, reporting time frames, and other issues. Standardize the basic criteria; leave compensability issues to state jurisdiction. That will only partially resolved issues. I do not believe the Grand Bargain should be dissolved; and Opt Outs should not be available in any jurisdiction. While it would make things easier from an insurance carrier perspective mandating minimums that must be met for each state kind of negates the states being in charge of this issue. It's also the first step towards the federal government takes over and we don't want that. I need my job and I pay enough taxes already! Keep the Federal Govt out of the comp system. State Insurance Commission should establish the minimum standards. Those standards should be voted by each state's senate and house and signed by each state's Governor. Reporting requirements, payment waiting period and % of earning for indemnity benefits, and coverage for related medical should be consistent. Indemnity benefits should be based on the State's cost of living and avg. wages. Medical benefits should be based on the cost of treatment for that state and what I mean by the cost is not the billed amount rather the average of the providers cost for that specialty and treatment with a reasonable profit. As to the actual treatment, these should follow appropriate guidelines based on medical outcomes. Settlements should be based on permanent injuries where the employee is not returned to pre-injury state, or if there is a permanent physical change. The states should agree on a basic minimum benefit and regulatory framework. That would ensure the continuance of state based regulation of insurance and keep the feds out of it. The Race to the Bottom is having horrific effect on injured workers. Federal intervention in state programs is untenable as each jurisdiction has it's own set of issues, culture, economic factors. States were created to organize, understand and control regional interests. Federal oversight, in check, would provide a metaphysic that finds common points among them for purposes of guidance. It also recognizes increased interstate activity in commerce. Enforcement, though, should be at the state level. This recognizes the need for local involvement, an economic responsibility concept, while still recognizing identical distributive functions. I was a member of the Interdepartmental Workers' Compensation Task Force representing region IX established by the Nixon Administration with the goal of establishing an OSHA type model for Workers'Compensation Insurance coverage nationally. We failed to achieve that goal. I believe in the State's rights and Constitutions should be held in a higher regard than Federal laws, as it was intentionally meant to be by the Father's of our country. However, I do believe there should be minimum standards that the states should agree on. Minimum standards such as min and max benefits is one thing however regulatory and reporting requirements is another. While regulatory requirements differing from each state is a friction point in the industry those requirements are routed in state statute based on what the state establishes as their workers' compensation system. Which process would be used a state such as administrative state like Texas or California or a state like Rhode Island or Delaware a more judicial state. Depending on the model the regulations differ greatly . WC is a state right. It is not the duty of the federal government to determine how each state takes care of its injured workers. The 10th Amendment says the Federal Government only has about 8 obligations and all the rest, if not specifically assigned to the Fed, are the domain of the individual states. Have you read Animal Farm? Workers compensation statutes should be the work of individual state legislatures that are more in tune with the needs and norms of their state than a federal entity ever could be. The argument for "minimum standards" ultimately is an argument for federalizing the Workers Compensation system. Consider the huge exposure in FELA claims vs the same injuries in a state regulated system. The plaintiff's bar would love it as payday would double or triple under a federal program while rates for wc insurance would skyrocket. Benefits established by the courts are, by their nature, jurisdictional. Is it possible to establish them as national standards? There are likely some, if not many, that are in conflict with one another. I understand that systems in right-to-work states are fundamentally different. 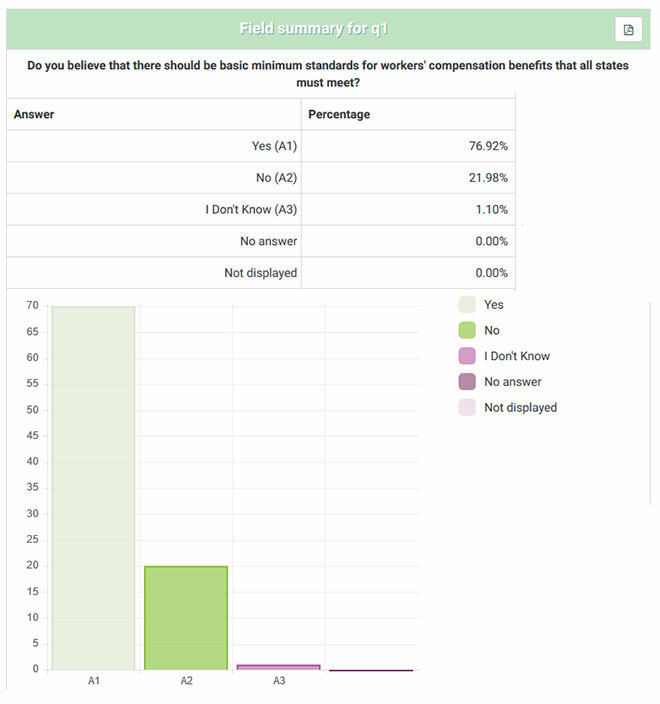 How can employer rights, employee benefits and system procedures be homogenized?There would seem to be an inherent conflict in the concept. If one state has a more onerous work comp system than another, then a business, an employee or an insurance carrier can make the choice not to go to that state. I have companies in 38 states, Canada and Porto Rico. It is very difficult for me to keep track of each rule for each state and insure that the process is completed with in statute. Uniformity of the standards would benefit all levels of Workers Comp management and implementation. 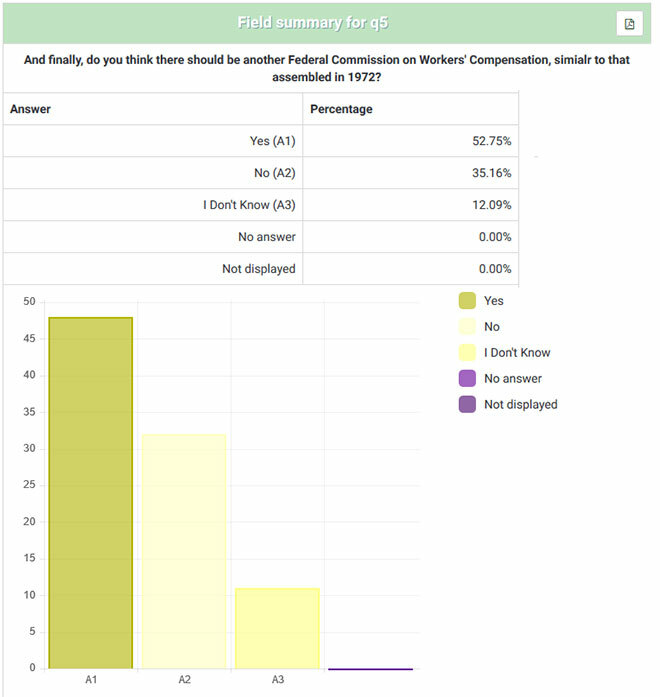 The under-reporting of WC claims to artificially reduce OSHA recordables and lower EMR's must be addressed. System is broken. Needs huge overhaul and better treatment for injured workers and make it easier for companies and carriers to deal with fraud.